I’ve posted several times over the past year about the shooting of two prison inmates at the High Desert State Prison, which is located at Indian Springs, Nevada, just north of Las Vegas. Lawsuits by the families of those inmates, Carlos Perez and Andrew Arevalo, claimed that a fight was instigated between the two prisoners by correctional officers in order to justify the shooting. Both prisoners were handcuffed behind their back at the time of the fight and the lawsuits maintain that neither prisoner represented a threat to the guards sufficient enough to justify them being shot. Carlos Perez died from his injuries, while Andrew Arevalo was gravely wounded but survived. Although it was later overturned, Arevalo was also “internally convicted” of murder charges by the warden relating to Perez’ death. As I’ve also reported, this and other incidents of shootings by Nevada prison guards led to a review of the use of force within state prisons and the use of shotguns in such incidents. A report produced at the conclusion of that review criticized prison guards’ use of shotguns by concluding “Nevada’s Department of Corrections (NDOC) is improperly relying on live ammunition instead of proper staffing.” Instead of accepting the advice to stop murdering inmates with shotguns, the NDOC responded to that report by saying they “hope to reduce the use of live rounds,” but won’t be doing so anytime soon and agreeing that they should hire more guards. Two weeks ago in my last update, I discussed the releasing of internal disciplinary reports from the original “investigation” of the shooting, which were released as part of the discovery process in the lawsuits brought by the parents of the inmates shot at High Desert State Prison. Although they didn’t address the claims of the fight being instigated by the guards, they did pretty clearly place the blame for the shootings on those guards. Earlier this week, former High Desert State Prison Correctional Officer Trainee Raynaldo J. Ramos was charged with two crimes in relation to the shooting of Perez and Arevalo. However, several questions remain regarding the nature of the charges, as well as the lack of any other indictments. In light of the conclusions included within the disciplinary reports, the inmates’ families and others believe that Correctional Officers Jeff Castro and Isaiah Smith, both of whom were also present during the shooting, should have been charged, as well. Ramos was charged with one count of the performance of an act in reckless disregard of persons or property resulting in death, and one count of involuntary manslaughter for his role in the death of inmate Carlos Perez. 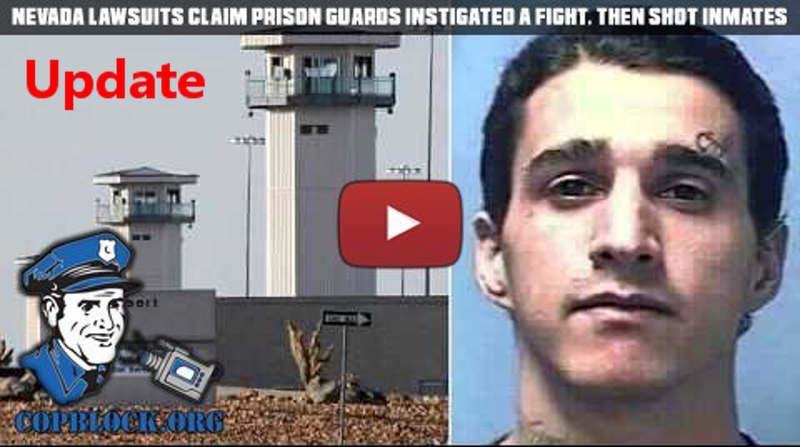 According to the criminal complaint, while serving as a correctional officer trainee at High Desert State Prison, Ramos shot Perez in the chest, head, and neck while Perez and another inmate were involved in a brawl. Perez died as a result of the shooting. Perez’s brother, Victor Perez, believes those involved should be held accountable for his death. “They can say all they want that it was an accident. I believe my brother was executed,” he said. Charges were not filed against two other guards who resigned in May 2015, according to the Associated Press. Perez’s lawyer, C.J. Potter from Potter Law Offices, said the two guards were present at the time of the shooting. “There’s two other corrections officers there. The Department of Corrections said they failed to intervene, they allowed the two to be in that situation to fight,” Potter said. ” We do feel that the other guards are at least partially responsible because they’re supposed to be training this guard to do things the right way and they didn’t,” Victor Perez said. Several other things including the length of time between when the issues were outlined in the internal reports, the fact that he was only charged for the fatal shooting and not the injuries to Arevalo, the changing stories that have been publicly released about the incident, and the previous attempt to charge Arevalo with murder for the death of Perez have all been pointed to as evidence of a cover-up by the prison administration. In addition, the fact that the trainee was the only one charged and the low level nature of the charges (often referred to as a “Policeman’s Discount”) that were filed against him has been characterized as a scapegoating tactic to draw blame away from the other two guards involved and the NDOC itself. It’s taken nearly a year and a half, plus allegations of a cover up, for the state to charge a corrections officer in a deadly prison shooting. Contact 13 explains why some say this is only half a cup of justice. In November 2014, two handcuffed inmates in a secured unit called “The Hole” got into a fight at High Desert State Prison. A guard fires multiple rounds to break it up. Inmate Andrew Arevalo is seriously wounded. Inmate Carlos Perez is killed. “Carlos’ mother, Mrs. Perez, was very concerned that there would never be that sense of justice in the case,” said Perez family attorney Cal Potter. On Monday, the Nevada Attorney General filed a criminal complaint against former Correctional Officer Trainee Raynaldo J. Ramos. Ramos is charged with “reckless disregard of persons or property resulting in death” and “involuntary manslaughter” for his role in the death of Perez, who was shot in the chest, neck and head. “Why did it take this long for these distilled charges to come down?” Potter asked. The charges come just one week after an internal prison report went public — blaming two other corrections officers for failing to follow safety procedures, failing to break up the fight and bringing “negative media attention” on the Department of Corrections. There is no mention in the report of Trainee Ramos. And for only half of the victims. Arevalo was injured by the same gun in the same incident, but no one is being held criminally responsible for shooting him. “This gives NDOC, this gives the AG’s office almost a scapegoat in COT Ramos,” said Arevalo’s attorney, Alexis Plunkett. “They’ve charged him with low-level felonies and they’ve charged the lowest person on the totem pole.